In 1959, Allegheny alumnus Ossian E. Carr offered a large monetary gift to Allegheny College allowing plans for the construction of a new science building to go forward. 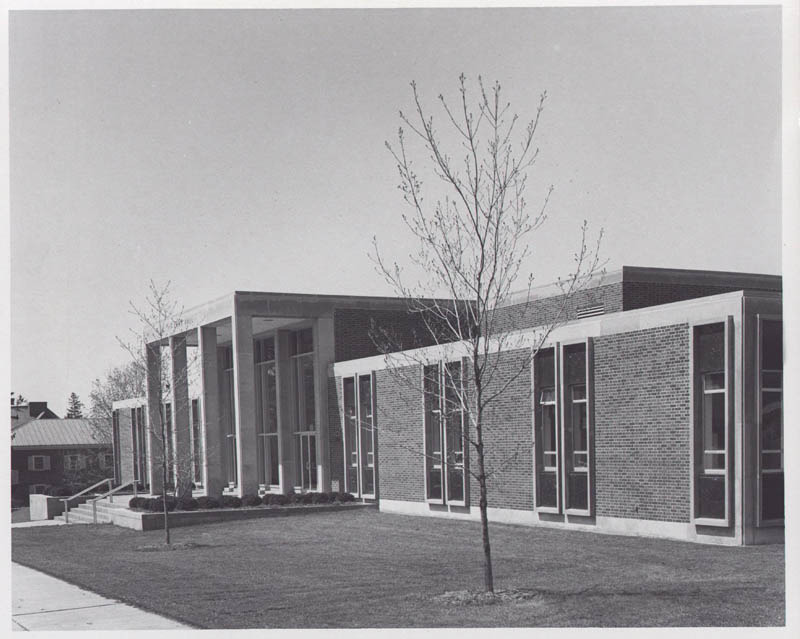 Construction on Carr Hall began in spring 1963 and by the fall of 1964, the new structure was opened. The modern-style brick and concrete building more than doubled the available space for the sciences on campus. Many of the clasrooms and laboratories were named for individuals and corporations who made donations to the College. The highlight of the building was the planetarium donated by Lewis "Bud" Wibel '42. 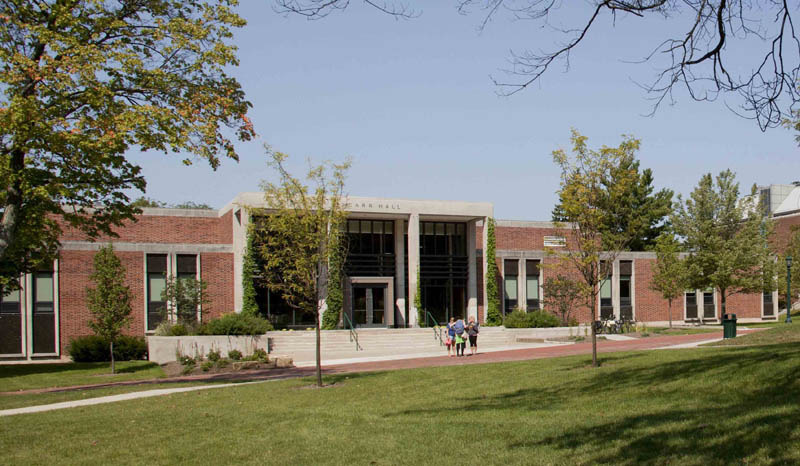 In 1995, Carr Hall underwent a $3.5 million renovation. Ossian E. Carr was alumnus of both the Allegheny Preparatory School and Allegheny College. In 1900, he graduated from Allegheny with a Bachelor of Science degree in engineering. His pioneering work in engineering led him all over the country. In 1955, he was awarded an honorary LLD from Allegheny. The new science building was named in his honor. Carr Hall: Carr Hall in 1969 after its recent construction. Image courtesy of the Wayne and Sally Merrick Historic Archival Center, Allegheny College. 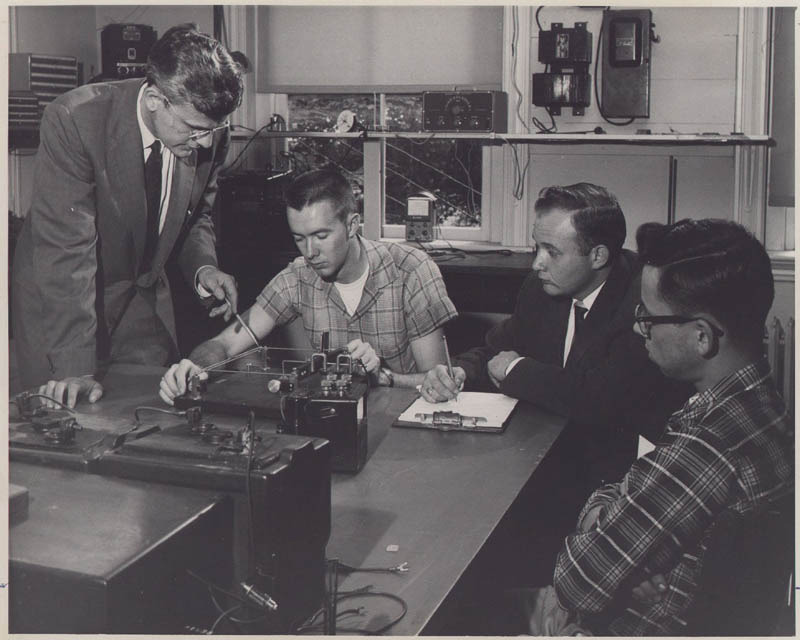 Carr Lab 1965: Students working in the newly installed labs in 1965. Image courtesy of the Wayne and Sally Merrick Historic Archival Center, Allegheny College. 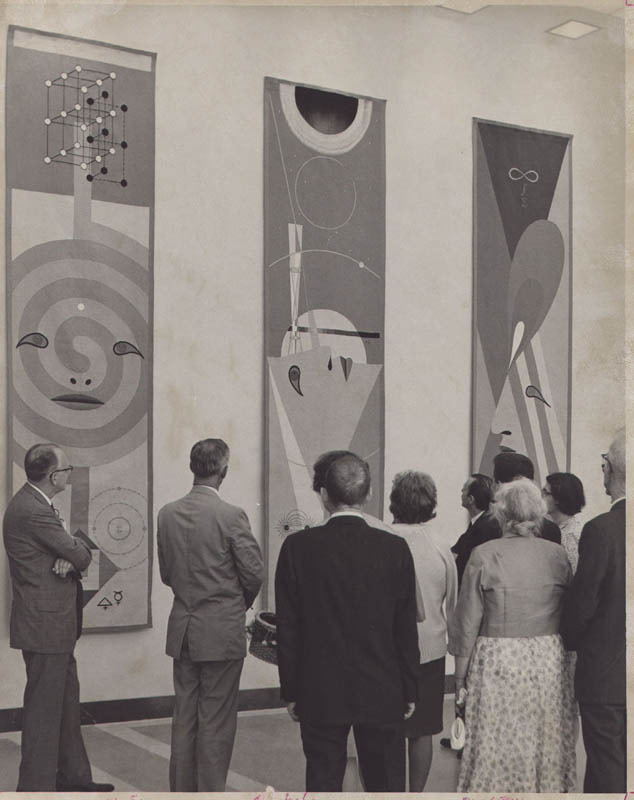 Carr Tapestries: A set of three modern tapestries commissioned for the entrance hallway honors the sciences. The tapestries adorned the entranceway for numerous decades but were eventually removed due to fading from light exposure. Image courtesy of the Wayne and Sally Merrick Historic Archival Center, Allegheny College. 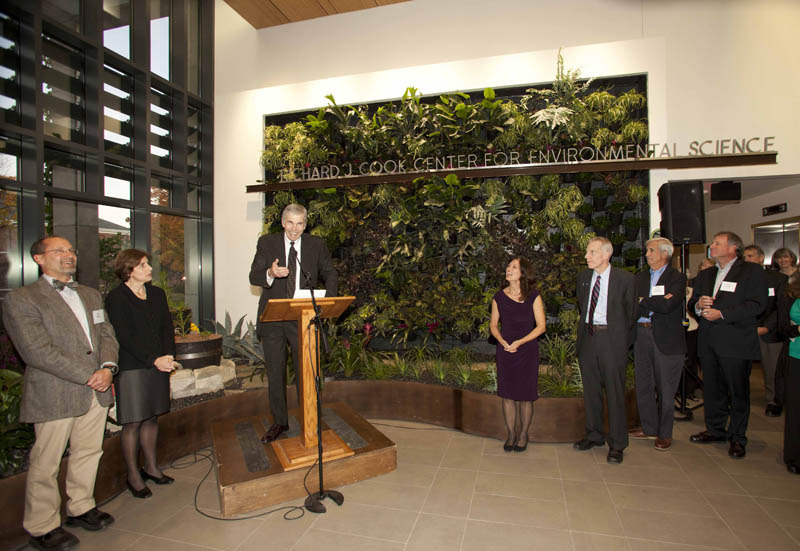 Dedication Ceremony: On October 12, 2012, the Richard J. Cook Center for Environmental Science and the Department of Physics was dedicated in a renovated Carr Hall. 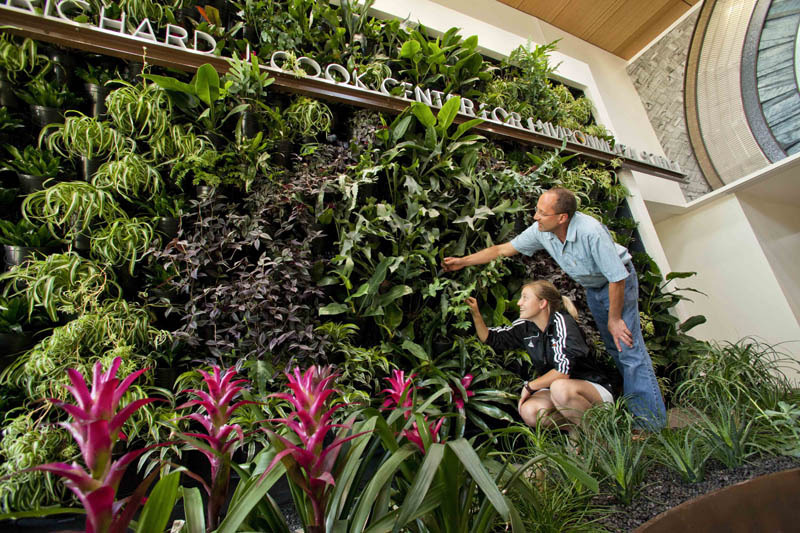 Visible behind Dr. Cook in the lobby is the living wall designed by students. Carr Hall Lobby, 2012: In 2013, Carr Hall received LEED (Leadership in Energy and Environmental Design) Gold certification from the U.S Green Building Council, recognizing the exceptional use of sustainable materials in the renovated building. . The lobby features day-lighting through the use of solar tubes to enhance natural light. Image courtesy of Allegheny College, William Owen, Photographer. Lobby Sculpture: The main lobby presents 40 by 8 foot recycled metal wall sculpture by the Pittsburgh based artist Jan Loney. Materials include wood grained aluminum materials from a swimming pool, old rusted handsaws, copper roof material, and heat exchange plates. Heather Joy Puskarich helped create the sculpture by incorporating her crafted art glass. 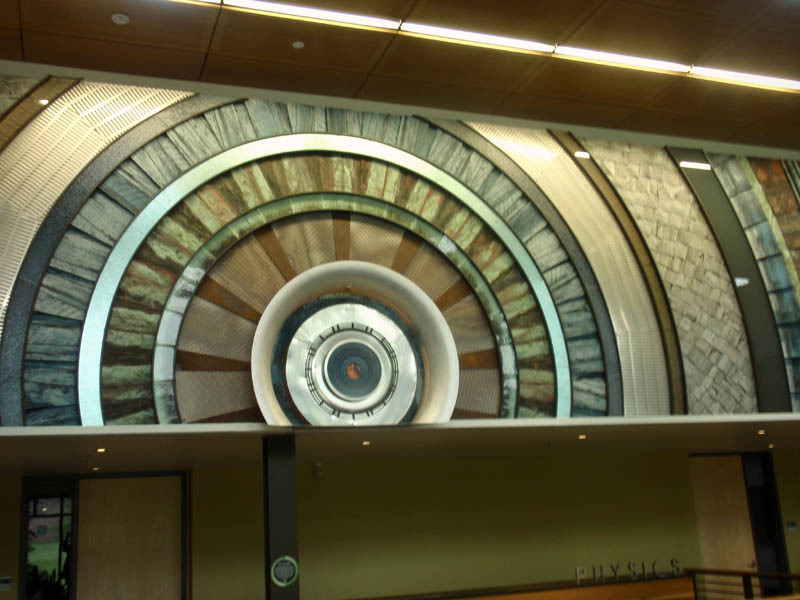 The sculpture was inspired by nature and draws much attention to the lobby. Image courtesy of Rachel Raczynski. Emily Hesch ’15 and Prof. Eric Pallant tending the garden. 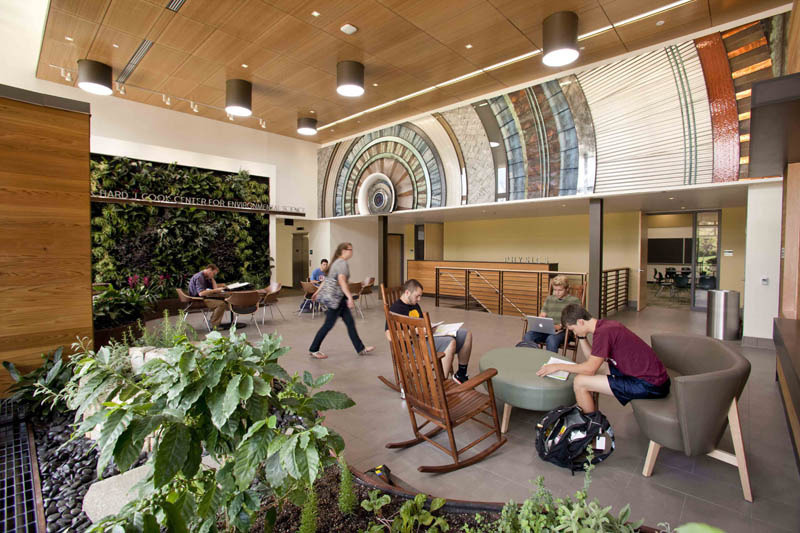 : The main lobby landscaping features herbs, fruit plants, various vegetation, the aquaponics system, and the green wall designed by students. The herbs and fruit are organic and safe to consume. The aquaponics system includes ornamental koi, marigolds, and water soundscapes. The aesthetically pleasing green wall is irrigated by rainwater collected from Carr Hall's roof and helps maintain healthy air quality. The lobby landscaping is provided care by student gardener Emily Hesch '15. Photo from October, 2012. Image courtesy of Allegheny College, William Owen, Photographer. Carr Hall Garden, Summer 2013.: An extensive garden was installed next to Carr Hall, built with the help of student volunteers. 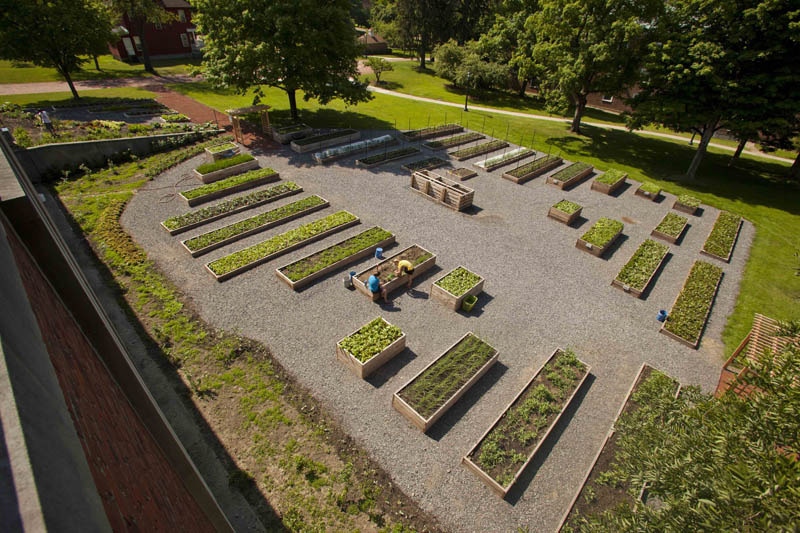 One purpose of the garden was to provide local organic vegetables and fruit to the Parkhurst dining halls on campus. Another purpose was to be used for educational reasons within environmental science classes. Some plants growing in the garden are onions, tomatoes, lettuce, eggplant, leeks, kale, peas, chard, strawberries, blackberries, raspberries, and blueberries. Sarah Barlow and Rachel Raczynski and Rachel Raczynski, “Carr Hall of Science,” NW PA Heritage, accessed April 26, 2019, http://nwpaheritage.org/items/show/2.